CUSTOM PROPELLER WORK FROM MARK CROXTON AVAILABLE!!!! 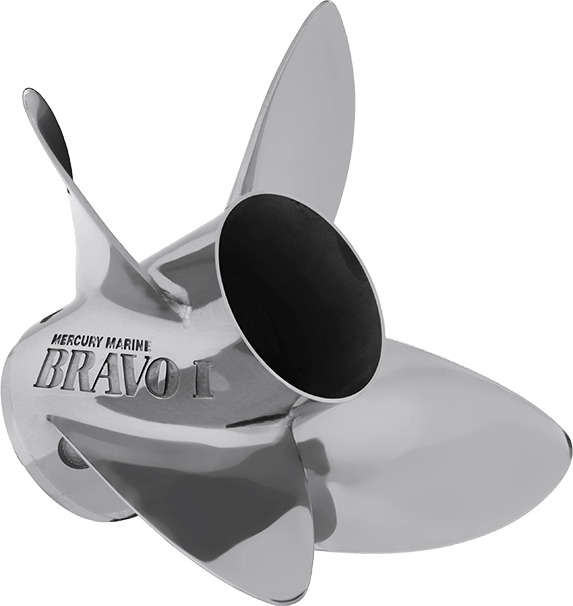 THE MERCURY RACING PRO FINISH BRAVO I XC PROPELLER, designed specifically for single outboard powered hulls, features a tremendous amount of blade cup. The enhanced cup enables the engine to be run at elevated transom heights – without sacrificing performance. The larger blade area enables the prop to stay hooked up for quick planing and enhanced performance throughout the engine rpm range. The exhaust tube is designed to support planing and stability at lower speeds. New 19” and 21” pitch models expands the line to a total of five pitch offerings – ranging from 19” through 22” in one inch increments for precision tuned applications. 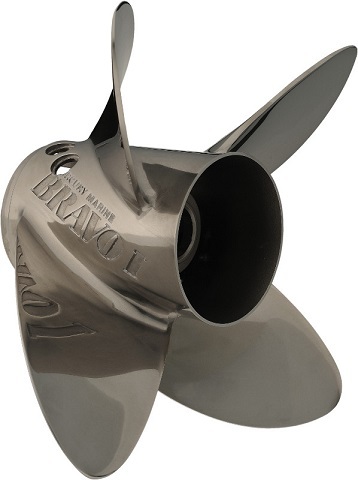 The Mercury Racing Pro Finished Bravo I XS outboard propellers offer excellent time to plane performance, sweet mid-range punch and awesome top-end speeds for bass, flats, cat flats and performance center console bay boats. 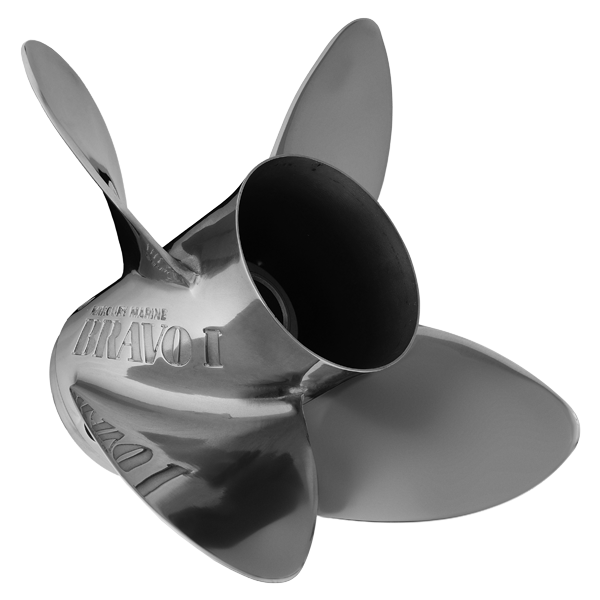 The stainless steel propeller, designed for use on Mercury V-6 OptiMax, OptiMax XS and OptiMax Pro XS outboards, features four robust blades and a tuned exhaust tube with 1″ vent holes for enhanced acceleration and mid-range punch. The shortened exhaust tube provides greater top-end speed while minimizing stern lift for improved boat handling and performance. XS Propellers have 8 PVS holes, FS Propellers have 4 PVS holes. These props are stocked according to demand. We keep all of the popular XS pitch props in stock and a select few of the FS series. Please call or email if you have any questions about this line of propellers. All of our Power-Pole inventory is the new CM2 design. The Power-Pole Blade Series is designed for the tournament or serious angler. Powered by our state-of-the-art C-Monster pump system, the Blade goes quietly from the full up position to 8ft or 10ft deep in seconds, and is strong enough to hold boats up to 23 feet or 3000 pounds in strong winds or current. The Blade Series has been tournament tested and proven in the most harsh fishing conditions. The Power-Pole Blade is the new “standard equipment” for the serious angler. GET DIALED-IN WITH MERCURY RACING® PRO FINISHED BRAVO I FS PROPELLERS. 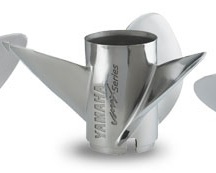 Designed for outboard and sterndrive applications, the stainless steel propellers deliver unmatched time-to-plane performance, mid-range punch, mid range cruise and top-end speeds for outboard bass, flats, cat flats, bay boats, offshore center consoles and sterndrive deck and vee bottoms under medium to heavy load. New 20.5” and 21.5” pitch offerings expand the popular Bravo I FS range – providing precision tuned performance for single engine OptiMax and Verado applications.